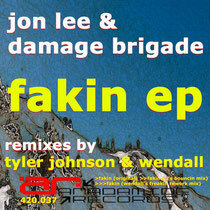 Seattle’s Jon Lee (Tilted / Dance Lab / Celestial) and L.A’s notorious Damage Brigade partner up on the tune ‘Fakin’, released 8th June on Anadamide Records, to deliver the west coast style of funk and flavour that they've helped build and establish for decades now. ‘Fakin’ is a bass grooving, spaced out breakbeat jam that should get the heads to the dance floor. Tyler Johnson has been a mainstay in the Vancity nightlife scene for some time, having moved there in ‘97 from a small town in British Columbia. He was soon hired by the legendary Futuristic Flavour record shop and under the mentoring of luminary DJ/producer Jay Tripwire, was able to parlay his passion for electronic music. Here, he weighs in with ‘T.J’s Bouncin Mix’, a chunky, heavy hitting, tech-house remix that keeps the funk alive. Anadamide label head, Wendall also brings his interpretation to the table with ‘Wendall’s Freakin Rework’, an atmospheric tech-house remix to keep pace with the big boys! Wendall has been moving floors across the US and around the world with highly skilled DJ sets and track selections. Starting in Seattle, he began DJing at parties in the ‘90s but after a few years on the west coast, moved to New York, working at Vinyl Market and gaining various DJ residencies. Developing his skills as a producer, Wendall also launched Anadamide records. Now back in Seattle, Wendall is no less busy, running the label, DJing and producing both solo and as one half of The Aurora Diving Club.